Discover how Weta Digital used 3D fractals to create show-stopping visual effects for round two of the Guardians. Plenty of filmmakers are looking for ‘organic’ forms to represent alien worlds or magical moments in their movies. So it’s perhaps unsurprising that they would seek to embrace fractals. After all, fractals tend to look like naturally occurring and infinitely repeatable objects, yet can often be simulated with mathematics. And so it is that several recent 3D movies have adopted fractals – especially three-dimensional ones – to help tell their stories. And they’ve seen use in immersive projects too, where fractal simulations can help realise complex forms for users to explore. The team at 3D World recently asked the artists at Weta Digital – who were tasked with making complex fractals for Guardians of the Galaxy Vol. 2 – how they went about tackling them. 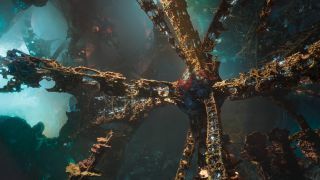 Put simply, fractals are complex, which is exactly why Weta Digital looked to them as inspiration for the Planet Ego sequences in Guardians of the Galaxy Vol. 2. The studio carried out some early tests embedding implicit functions into its proprietary Manuka path-trace renderer via plugins, with promising results. It matched the client concept art – which specifically featured 3D Apollonian gasket-like shapes – but soon realised that relying on purely mathematical functions could be limiting. So Weta Digital considered modelling by hand, but again abandoned this approach due to the infinite detail required (“Also, the models supervisor yelled at me when I brought it up,” says Smith). That left the studio with new requirements: defining an arbitrary shape that was art directable but could still match those gasket shapes, and achieving a digital environment that felt like it had infinite practical detail. The R&D team devised a method that let artists use curves to define an axis and a profile in Maya, and then code that would use a custom sphere-packing algorithm to boolean out spheres from the first shape, to give the appearance of an Apollonian fractal in a user-controlled volume. “For the detail, instead of trying to add infinite fractal minutia, we used an in-house piece of software called Genesis to essentially spray-paint little instances of fractal geometry all over the resulting shapes produced by the first tool," explains Smith. Then, a stumbling block. The Maya plugin could not quite achieve all the shapes in the concept art. Weta Digital needed a way to generate some of the more esoteric forms from the art that had originally come from Mandelbulb software, but attempts thus far had required prohibitive amounts of memory without the required resolution. The solution, devised by senior modeller Pascal Raimbault, was to generate a 4K turntable of the relevant areas in the Mandelbulb software – instead of geometry – and then feed those renders to Weta Digital’s photogrammetry software. This article originally appeared in 3D World issue 237; subscribe here.